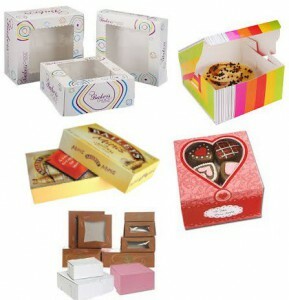 Bakery boxes are used to package bakery items like cake, Pie, Pastry, Cupcake, Donuts and other bakery sweets. These packaging boxes are available in different styles and sizes. Bakery boxes are the must have item for any bakery offering these products. Most of the bakery boxes are made out of organic and food safe materials. Below are the styles of the wholesale Bakery Boxes along with size and design specs those must be known before ordering these from any Custom Bakery Boxes factory. A lot of bakery boxes are made in 4 corner bear style because this is the most convenient packaging style for bakery items. These boxes don’t require any assembly because these are pre-Glued and are folded. These style boxes takes a very less space because of folding option and are very easy to assemble. Just need to pop the box up and they are ready for use. These boxes usually have window on the top with plastic cellophane on it. 4 Corner bear style boxes are also less expensive than the other styles available in market. Bakery boxes also comes in Tuck top & auto lock bottom style. These style boxes also ships flat and are pre-glued and are very easy to assemble. One drawback in this style boxes are that these consume more cardboard than the 4 corner style so these are more expensive than the other style boxes. Plastic window can also be added in these style boxes and custom color printing can also be added on all sides. Lock corner bakery boxes are also one of the less expensive packaging option but these boxes don’t ship pre-glued and ship as flat sheet and takes a lot of time for assembly. These boxes takes less storage space but are hard to fold and assemble. Custom cutout window can also be added on these boxes and color printing can also be done on both outside and inside. Bakery boxes also comes in two piece style but these are expensive than other options as well as takes more time to assemble. Because these ships flat and require assembly by folding both top and bottom lid. custom window can also be added on these boxes along with plastic cover. Wholesale Bakery Boxes also comes in gable top style. This style boxes are also nice and easy to assemble and also have handle at the top for easy handling. Custom window can be added on these along with custom color printing. Custom Bakery boxes comes in many different sizes and here are some of the standard bakery box sizes those are available for order. Other custom sizes are also available but custom sizes are always more expensive than the available standard sizes because custom die creation is require in this case.